Roughly two and a half years after the service first started, Yakima Transit has announced that they plan to discontinue the Yakima-Ellensburg Commuter, with the last day of service on July 1st, 2014. This continues a recent trend of cutbacks of service at Yakima Transit, with the recent discontinuation of Route 8 and modification of Route 1, which was initially postponed by city council vote but later approved. When the Yakima-Ellensburg Commuter first began, it was largely supported by a grant from WSDOT that Yakima Transit and Hopesource had been trying to get for several years prior. At the time, the only intercity bus links that were available were Greyhound and Central Washington Airporter, both of which have base fares that are too high for a lot of potential passengers. 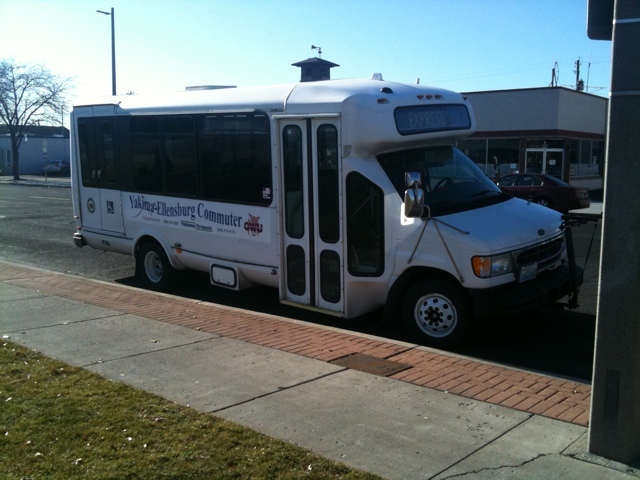 With the launch of the Yakima-Ellensburg Commuter, access between the two cities was greatly improved, particularly for people using the bus to attend classes at Central Washington University in Ellensburg and Yakima Valley Community College and Perry Technical Institute in Yakima. The main reason being cited for the discontinuation of the Yakima-Ellensburg Commuter is the unavailability of state funds. As I mentioned earlier, the service was launched using a WSDOT 2-year grant, and it was continued last year with another 2-year grant. (Note that Yakima Transit will likely have to return part of the grant if the route is cut). Officials stated that “the State has made it clear to the City that no further state funding would be made available for this service including the purchase of more reliable buses.” Without getting off on a tangent about WA’s paltry financial support for public transit, it just comes down to money. Without any sort of financial security for the service, it’s hard to make the case for continuing a service that Yakima Transit themselves recognize as “highly successful,” even though the overall savings in the budget will only amount to $65,000. Riders would likely support a small fare increase in the face of a complete loss of service, and if pressed hard enough CWU could possibly increase their contribution, which is collected from a mandatory student fee. As I mentioned in the News Roundup last week, Yakima Transit Route 10 (which is operated under contract for the City of Selah) was going to be extended to the Firing Center P&R to give Selah residents a connection to the Yakima-Ellensburg Commuter. While it would likely be small, Selah’s contribution could also be potentially increased. However, almost all of these groups are operating on tight budgets as is, so the future of the route may be a foregone conclusion. Now, as if the potential loss of the Yakima-Ellensburg Commuter wasn’t enough, Yakima Transit is also looking at ending all fixed-route service on Sundays, which will go into effect April 13, 2014. Like the Yakima-Ellensburg Commuter, funding for Sunday service has been largely reliant on grant funding from WSDOT, the most recent one being a CMAQ (Congestion Mitigation Air Quality) grant. The current grant funding runs out on the proposed day of Sunday service discontinuation, and Yakima Transit officials state that they will not be eligible for another grant for the service until July 1st, 2015, in accordance with the WSDOT funding cycle. Currently, Sunday service, which sees service on 6 routes on hourly schedules, is costing Yakima Transit $198,000 each year (with $33,000 coming from Selah to operate Route 10). Sunday service is roughly on par with weekday productivity on fixed-route service in Yakima (averaging 18 passengers/hour, versus 23 passengers/hour on weekdays). Again, without any financial security to maintain the service, Yakima Transit is left with a lose-lose situation in this decision. If you’re interested in voicing your concerns about these potential service cuts, the Yakima City Council will be voting on them this Tuesday, March 11, 2014. The meeting starts at 6PM inside the council chambers at City Hall. If you’re unable to make it, check back here on transit509.com the next day for the latest news on this.